Home ownership comes with many responsibilities, including maintenance of the interior, exterior, and landscaping of your home. A willingness to get your hands dirty and do-it-yourself can save you money and help you hone your handy man skills. However, some home projects are more suited to a “DIY” solution than others. Cosmetic changes, like painting, adding a backsplash, or planting flowers? Go wild! But when it comes to large or complicated projects that involve specialized knowledge, techniques, and equipment, it’s best to leave it to the professionals. Examples of home improvement projects you should definitely leave to the professionals include structural changes to your home (like building an addition or tearing out walls), electrical and plumbing work (the stakes are just too high to risk a “learning experience”), and yes, tree removal. Heavy objects, sharp tools, heights, and inexperience are a recipe for disaster. But don’t take our word for it! Check out #1 on 10 Projects You Shouldn’t DIY. At our licensed, insured Gainesville tree service company, safety is our first priority. We have over a decade of experience in tree removal and tree trimming, so you can rest assured that the job will be done right. Whether you need a dead tree removed, want to raise the canopy of the trees in your yard to allow for more light, or just need seasonal tree trimming to keep your trees in optimal condition, we’re happy to help. 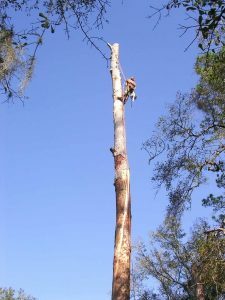 Contact us today to get a free estimate on tree removal and other tree services in Gainesville, Alachua, and Newberry.